Today, Google announced that its search results has a new feature “Search plus Your World” which lets users find Google+ posts and Picasa photos through the main search site. Now, you can gather information from people that you are actually connected to through the posts that they have shared publicly or with you in a limited group. This new feature will be rolled out to those users searching the Google site in English and signed into a Google account. Google Fellow, Amit Singhal provides some practical examples of how the new feature works on the Google Blog. For example, his childhood dog was called Chikoo, named after a sweet fruit found in parts of Mexico, Central America and the Caribbean. 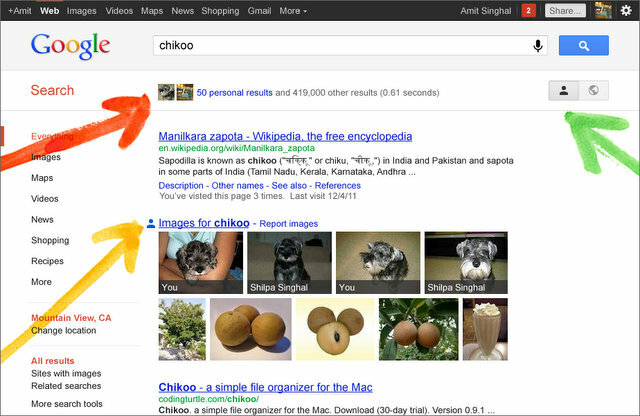 When Amit was signed into his Google account and plugged in a search query for Chikoo, his results were a blend of Picasa photos and Google+ posts (even those he shared with a limited circle) about his dog, as well as his favorite fruit. 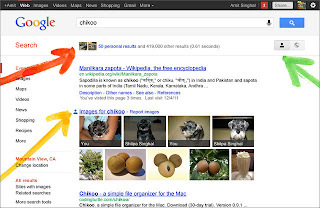 This screen capture below (courtesy of Google) shows the Chikoo results and shows the other features of “Search plus Your World.” Google provides a handy toggle bar (indicated by the green arrow) for those people who don’t want a blend of personal and public results with the “Search Plus Your World” feature. The red arrow indicates how to search only within your personal Google+ and Picasa results. Through the “Search plus Your World” feature, Google profiles and contacts will now be easily searchable and will populate the search box automatically through autocomplete. This new feature makes looking for a specific person easier. Additionally, if you are logged into Google, you can automatically add that person to a Google+ Circle directly from the search results. Amit gives the example of searching for his friend Ben Smith. 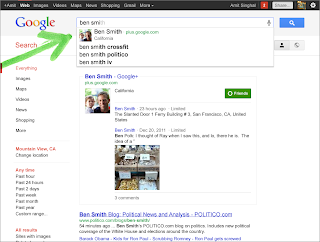 Google populates Ben’s name automatically in the search box and directs Amit to his friend Ben’s Google+ profile. 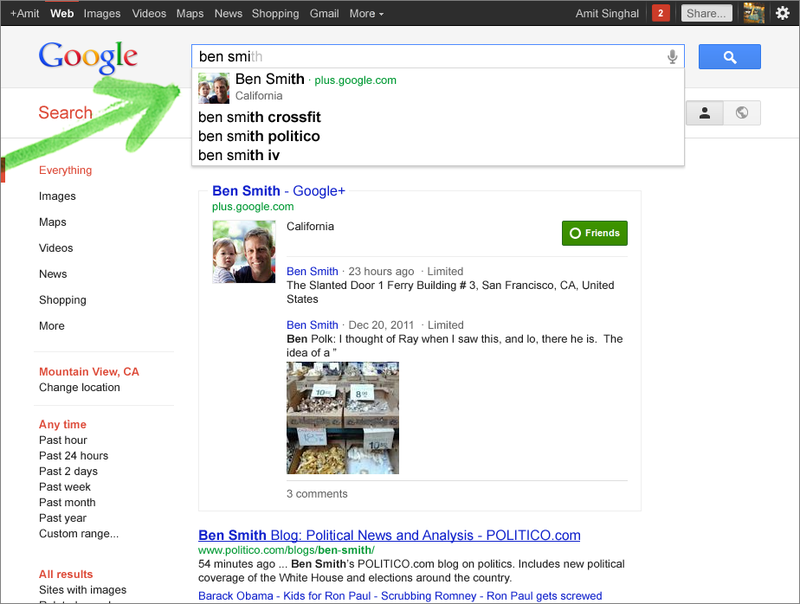 Instead of giving Amit all the search results for many Ben Smiths on the Internet, his search is personalized for his network on Google+. When signed into Google, the blend of search results and private content is protected automatically by SSL (secure sockets layer) for the highest encryption and security. The personal search results, whether they are from you or your connections, are clearly labeled “public,” “limited,” or “only you” depending upon how the content was originally shared via Google+ or Picasa. What is interesting about the "Search plus Your World" feature is that you don’t need a Google+ profile to see the personal results. This is just the first concerted step towards integrating more Google products into search results and I’m sure it won’t be the last bit of news coming from Google this year. This could be a new strategy for PR people to connect with new media sources and journalists, as well as a way to “crowd source” opinions from your connections. How do you envision this change to Google search affecting your industry?